Written from the perspective of a scholar and performer, Traditional Music and Irish Society investigates the relation of traditional music to Irish modernity. 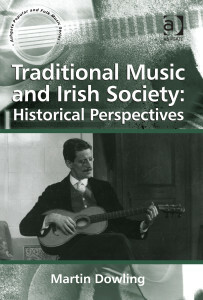 The opening chapter integrates a thorough survey of the early sources of Irish music with recent work on Irish social history in the eighteenth century to explore the question of the antiquity of the tradition and the class locations of its origins. I argue in the second chapter that the formation of what is today called Irish traditional music occurred alongside the economic and political modernization of European society in the late eighteenth and early nineteenth centuries. I then illustrate the public discourse on music during the Irish revival in newspapers and journals from the 1880s to the First World War, also drawing on the works of Pierre Bourdieu and Jacques Lacan to place the field of music within the public sphere of nationalist politics and cultural revival in these decades. The situation of music and song in the Irish literary revival is then reflected and interpreted in the life and work of James Joyce, and I include treatment of Joyce’s short stories A Mother and The Dead and the ‘Sirens’ chapter of Ulysses. The final chapter reflects on field work I conducted with Northern Irish musicians during 2004 and 2005 and on my experience performing and working with musicians and arts organizations and assesses the current state of traditional music and cultural negotiation in Northern Ireland in the second decade of the twenty-first century.